It was forbidden for monks to play card games on the premises because of frantic fad of the monks and noble for the card game. il était interdit aux moines de se livrer au jeu de cartes dans son enclos en raison de l’engouement frénétique des moines et des nobles pour le jeu de cartes. In 1337, there is also mention in the statutes of the Abbey of St Victor of a ban on playing with "paginae" (Latin: parchment, page, paper). This word may apply to playing cards, because in 1408, the words "papier pour jouer" (paper for playing) and "carte" (card) were used in the same sentence to refer to the same game. This would be explained by the fact that the word "naip", which was used in Spanish to refer to cards, could have come from the Flemish word "knaep" which means paper. In fact, at the time the Spanish and the Flemish had trading relations. The primitive word for playing cards would therefore have been "paper for playing", abbreviated sometimes to "paper". This is the hypothesis of the famous playing card specialist Henri-René D’Allemagne, a theory to which I also subscribe. The Master Cartiers of Marseilles must also have existed at the same time, even though they were not officially permitted by the king until 1638. They are in fact mentioned at the time of a petition from the master cartiers of Lyon, reproaching some master cartiers of Marseilles for counterfeiting card decks using their names and trademarks. In 1369, a royal decree prohibited playing cards in the whole of France. The results, however, were precisely the opposite. "At the beginning of the 5th century, a monk originally from present-day Romania arrived in Marseilles. His name was John Cassian. He had spent time in Bethlehem, Constantinople, and Egypt. It may have been Lazarus, bishop of Aix, that had brought Cassian back with him when he returned from the council of Diospolis. John Cassian is very probably the founder of the monastery of St. Victor, and in any case was the author of the regulations of this establishment, the Cenobitic Institutes (between 419 and 425). These regulations made him the lawmaker of Western monasticism. The arrival and the work of John Cassian is as much an historical certainty as the personality of Victor, a Christian officer in the Roman army who was executed in Marseilles in 290, consists for the most part of conjecture and legend. The abbey’s crypt, however, retains archaeological vestiges which testify to the presence of a quarry from the Greek era. As a result of difficult periods, invasions by barbarians and Saracens, all traces were lost from the seventh to the tenth centuries. 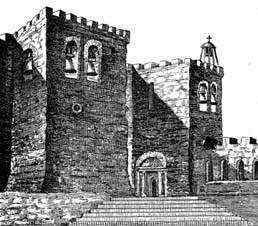 In 1020, a Catalan monk named Isarn began a great undertaking: finally, near the end of the tenth century, the abbey was completely rebuilt according to Roman standards. 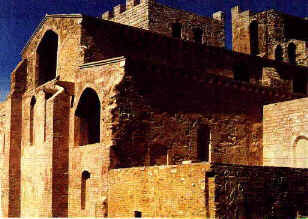 The fortification that would include the abbey in its coastal defenses is attributed to Guillaume de Grimoard, who later became Pope in Avignon under the name Urban V. This fortification was eventually entirely restored, after passing through various stages such as food depot, prison and barracks."